Let me rephrase my previous blog, IT’S WET OUTSIDE! The weather was turning cool nicely with the last of the summer rays still in sight but suddenly that all disappeared. For the past week, I have been fighting to hold my umbrella in gusty conditions while trying to keep myself dry from the rain. On several occasions, my shoes were throughly soaked and the squishy sensation walking around London with wet socks was cringe worthy. On top of that, it is too warm to wear anything thick but too cold to just go out in a T-shirt. Sounds like I need a light weatherproof to withstand the wind, rain and the fluctuating temperature. Honestly I’ve been considering if I should go into one of those ‘outdoor’ shops to buy a jacket but if I could find the fabric for this project, I might as well make it myself and have something that fits nicely. This was one of the rare occasions that I actually requested for samples instead of immediately buying the fabric. The reason was to check the waterproof property of the fabric. The samples I got were coated cotton as I didn’t want a 100% synthetic fabric. There is nothing I hate more that the wet sweaty feeling under fabrics that doesn’t breath. As part of the waterproofing test, I dropped water onto the fabric and left it overnight to see if the fabric soaked up any water. 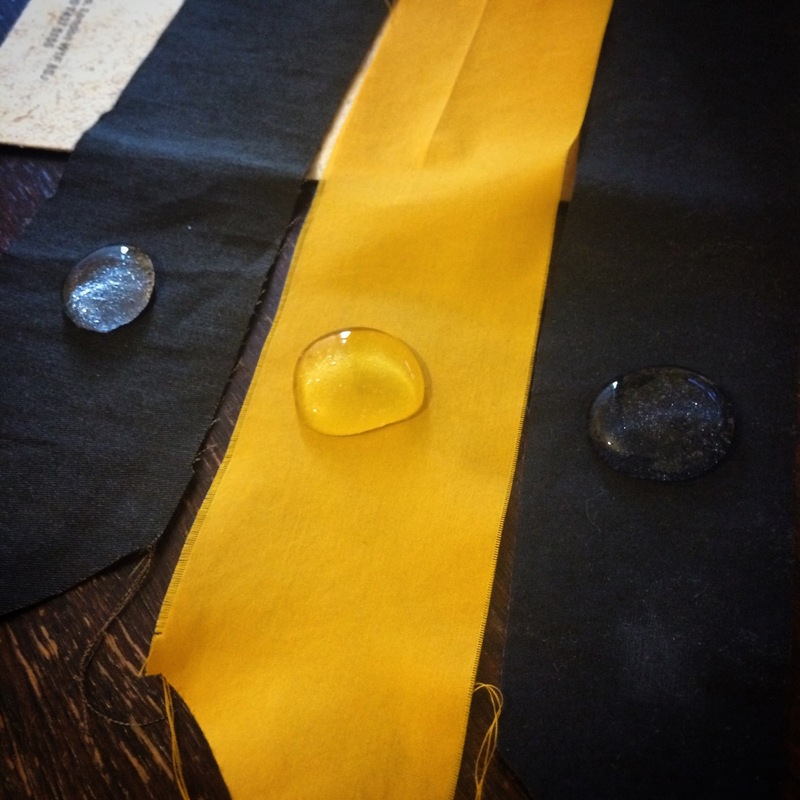 The result was very positive so I decided to go back the week after to get the yellow colour coated cotton fabric. As for the lining, I decided to get the black mesh that I used to make my T-shirt (here). The pattern for this jacket was very straightforward. It is basically the same pattern I used to make the winter jacket (except for some minor changes to lining and the size of the hood). It’s amazing how a good pattern can be so adaptable. If you don’t know me by now, I have a habit of needing to make something. When I am not doing anything, I get very restless and irritated. Everyone around me knows of this and strangely enough, they look forward to see things I have made during the weekend or on my days off. They get really surprised when I tell them I had a quiet weekend and did not make anything. So it seems like this weekend I lived up to their expectations. 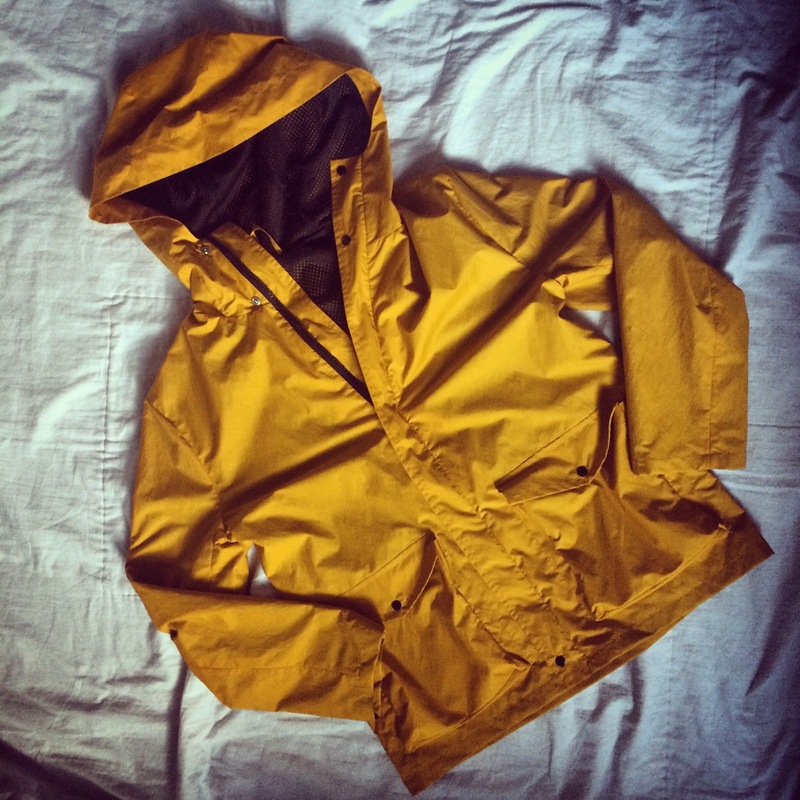 I think I saw something similar being sold in Lambs Conduit Street but I also remember it costing an arm and a leg, so I’m quite happy to finally own a proper weatherproof jacket. I can’t wait to wear it to work but as I checked the weather for today, it seems like it is going to be dry. Typical!